The 20th annual Dundarave Festival of Lights kicked off Nov. 26 with live music from noon to dusk as the forest of Christmas trees on West Vancouver's Dundarave Beach were decorated by various businesses, organizations, schools and individuals in preparation for the official lighting to follow in the evening.The initiative is a fundraiser for the Lookout Emergency Aid Society's North Shore Shelter and has raised more than $75,000 over the last three holiday seasons. The decorated trees will remain on display until Jan. 6, 2012. A Christmas Wassail and Bonfire Night is set for Saturday, Dec. 17, from 2 to 9:30 p.m. The gazebo on the beach in West Vancouver's Dundarave community, ground zero for the neighbourhood's annual Dundarave Festival of Lights, is minutes from some of the most sought after and expensive real estate in the country. It's also just steps from where some are forced to sleep outside, enduring near-freezing nights, holiday season or not. A study in contrasts if ever there was one, for both the outsider who may assume West Van is home to only the wealthy and local residents who aren't used to seeing examples of homelessness in their neck of the woods. One such resident is Michael Markwick, a communications instructor at Capilano University and spokesman for the festival. While in the classroom, Markwick routinely talks about issues surrounding homelessness with his students, including frank discussions about how many of those in the room believe that they will have secure housing within 10 years of graduation. These days, he says, no one's hand goes up when he asks that question. And while the power and importance of university-level discourse shouldn't be diminished, one's perception changes when faced with the reality — in this case the remnants — of homelessness so close to home. "We get to the beach [at Dundarave] and we see emergency blankets steps from where the trees are. It was shocking," says Markwick. "It shocked me and I've been researching homelessness and taking people to the Lookout Shelter. It's a Dan Ackroyd moment. You feel like you're on some mission from God, like you can't do enough. So, how did I feel? I felt impatient." In 2008 when Markwick went to the Beach House to offer his yearly support, he was told the restaurant would no longer be organizing the holiday fundraiser. There simply wasn't any time, he was told. Instead of shrugging his shoulders and looking for another cause to support, Markwick decided he was interested in taking on the responsibility of spearheading the event that year. But his newfound role would require some quick thinking — he got involved only six weeks prior to Christmas that year — a lot of work and a new team for support. 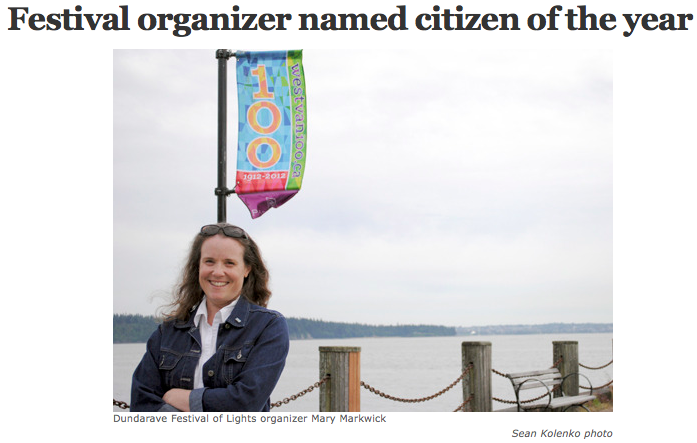 Markwick and his crew first decided to change the business model for the festival, creating a non-profit entity called the Dundarave Festival of Lights Society. Then, the donation process changed. In the past, donations were made to the restaurant to pay for a tree and a portion of the money was then given to a charity. 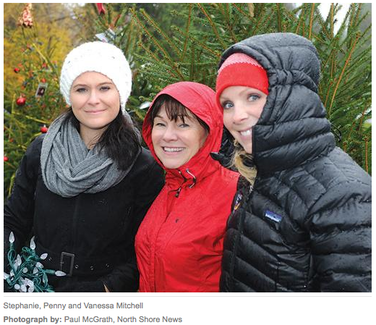 With Markwick and his team at the helm, those interested in contributing financially to the festival are asked to give $110 to put a tree in the ground at the Dundarave gazebo and make a charitable donation to the Lookout Society's North Shore Shelter. "When we rolled this plan out in 2008 we were facing the credit crunch and a global downturn in the economy and we had only six weeks," says Markwick. "And it was an astounding response. Led by the contributions of the firefighters we raised $25,000 that year." Before 2008's contributions were tallied, organizers of the festival took a tour of the North Shore Lookout Shelter and were blown away by the facility's large restaurant-style kitchen. When Markwick and company inquired about who used the space, they were told the kitchen was sporadically used by church groups but sat empty most of the time. Employees at the shelter, however, did express an interest in housing a vocational cooking program for the homeless or those at risk of homelessness. After hearing those plans, Markwick knew where the money was to go. All $25,000 raised that year went to establishing the North Shore Culinary School. Fast forward three years and, under the leadership of chef Don Guthro, the success of the program has prompted Guthro to consider an expansion into the vacant building formerly used by the North Shore Horseshoe Club in North Van's Mahon Park. "The Dundarave Festival of Lights is a powerful community event," says David Newberry, community liaison worker at the North Shore Shelter. "It raises awareness of a very important issue as well as the political will to change that." In his role with North Shore Shelter, Newberry is tasked with discussing homelessness with those in the community and raise awareness of the issue across the North Shore. Just as Markwick was shocked to see emergency blankets on the beach in West Van, so too are some that Newberry speaks with about the state of homelessness north of the Iron Workers and Lions Gate bridges. There is this notion, he says, of perceived wealth on the North Shore and that there are no homeless. But having wealth doesn't mean there isn't poverty, adds Newberry, and this year's homeless statistics are a testament to that. According to figures released last May as part of the Metro Vancouver Homeless Count, there are 117 people identified as homeless on the North Shore. That number is down from the 123 counted in 2008, but Newberry says both numbers illustrate but a snapshot of a larger picture. The 117 people counted this year only represent those that could be located during the 24-hour window that the homeless count was being done. The North Shore number, Newberry suggests, is likely closer to 300 people. As a result, the North Shore Shelter, which has 45 emergency shelter beds, operates at 104 per cent capacity year-round. "It would be more if we could do more," says Newberry. "The need is certainly greater than 45 beds plus four per cent." How to solve such a problem quickly becomes an intensely political discussion, and any hope of ending homelessness will require the construction of not just shelters but of affordable housing. Newberry calls this phase "the next step." But what does the community do in the interim? How does the North Shore tackle an issue that can often feel insurmountable? From a grassroots level it's about raising awareness and funds, both "vital ideas" and things the festival does well, Newberry says. "The Dundarave Festival of Lights is working to pursue options," he adds "and it is facing a profound problem." The other focus of the Dundarave Festival of Lights is to support the arts. By creating the aforementioned non-profit society, festival organizers were able to begin applying for arts-related grants from the government. In 2010, the festival received $45,000 from the Department of Canadian Heritage. In 2011, they received another $41,000. 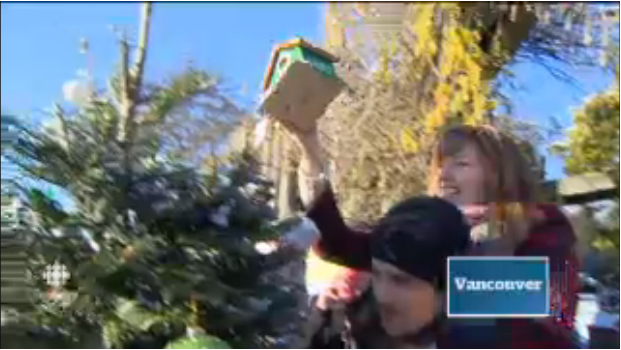 That funding has gone to support, amongst others, the West Vancouver Youth Band and a handful of local school choirs. “That money has changed the equation of the festival. Not a penny of that money can go to homelessness; it goes to our local arts and culture community” says Markwick. In addition to the financial support drummed up by the event, the festival also offers a venue for a wide range of performances. For the four Saturdays leading up to Christmas, the Dundarave Festival of Lights showcases a myriad of performers, from independent singer-songwriter acts to those who dabble in more ancient pursuits. June Harmon, who grew up in Dundarave, is a performer with the Tiddley Cove Morris Dancers and Musicians, a festival staple. Harmon says the traditional-style performance — morris dancing is a form of English folk dance some trace back as early as the 13th century — fits in well with Dundrave’s village history. But the fact that her troupe’s show is part of a festival also geared to supporting larger societal problems isn’t lost on her. In fact, Harmon says the arts are a perfect catalyst to support social change. “The arts can make us give and think of others. It’s a way to tap into people’s natural desire to help,” she says. —For a full schedule of performers at the Dundarave Festival of Lights, visit dundaravefestival.com. For those interested in donating money, click the “show your love” link on the homepage.